1/35 scale assembly kit depicting infantrymen from Field Marshal Rommel"s vaunted Africa Corps. 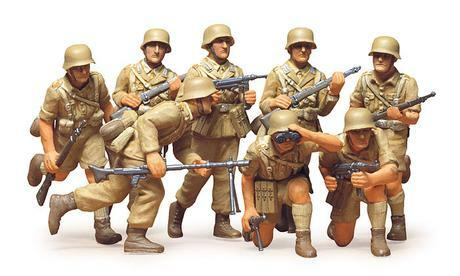 Special Feature 1 Set includes 8 figures depicted in tropical uniform (4 figures feature long-sleeve shirts and trousers, 4 figures feature short-sleeve shirts and shorts). Special Feature 2 Comes with parts for both helmets and field caps to provide assembly options.